Goyang, South Korea (AP) – A day after the leaders of the two Koreas met for a summit along their shared border, the emotional, memorable, even funny scenes from their time together are both a bitter reminder of the countries’ seven decades of division and an insight into the mysterious character of North Korean leader Kim Jong Un. 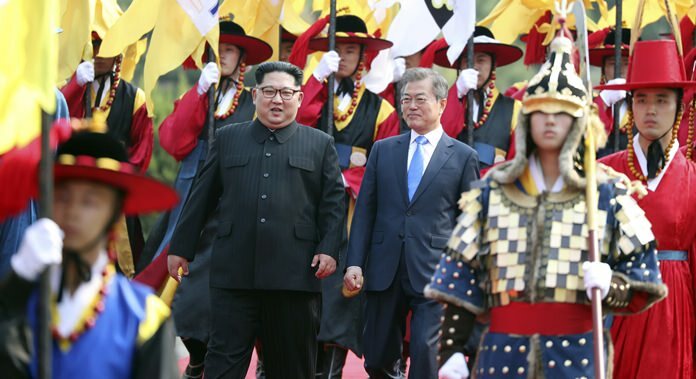 Kim became the first North Korean leader to set foot onto South Korean land since the 1950-53 Korean War when he stepped into the southern side of the border village of Panmunjom to meet with South Korean President Moon Jae-in on Friday. The image that lingers is of Kim stepping across the ankle-high concrete slab that forms the military demarcation line at Panmunjom and shaking hands with Moon, both leaders broadly smiling. 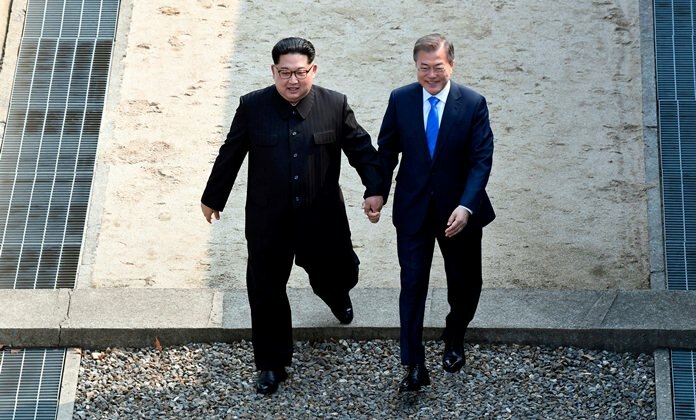 Kim then took Moon’s hand and led him back across the borderline into the North, where they posed for a ceremonial photo together before returning to the South. Moon, whose parents were refugees from North Korea during the war, visited the North’s Diamond Mountain resort in 2004 to meet his aunt during a temporary reunion between war-separated families. After their meeting at the borderline, Kim and Moon moved to a small plaza to inspect an honor guard before walking together for a couple of minutes to the Peace House, the venue for the summit. 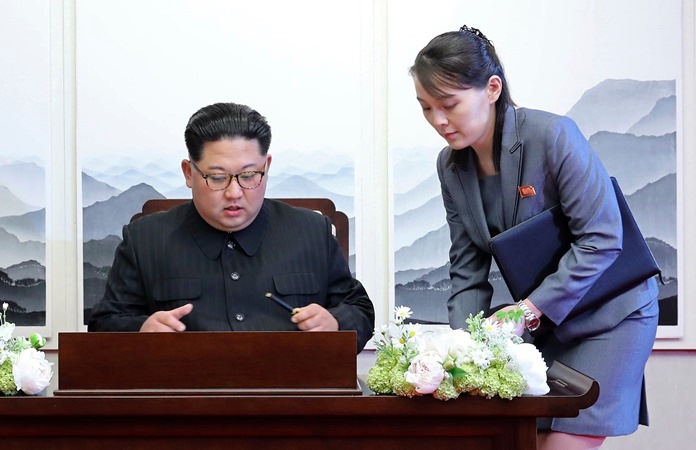 Despite the relative short bout of exercise, live TV footage showed that an obese Kim was panting heavily through his mouth, his shoulders heaving a bit, as he signed a guestbook. South Korean media quickly speculated that Kim, 34, is about 170 centimeters (5 feet 8 inches) tall and weighs 130 kilograms (287 pounds), and likely suffers from diabetes, high blood pressure and hyperlipidemia. In 2014, Kim disappeared from the public eye for about five weeks, triggering a frenzy of speculation about his health. When he resumed his public activities, he walked with a cane. Kim’s father and grandfather both died of heart ailments. When Kim returned to the northern side of Panmunjom in a black Mercedes limousine for lunch after a morning meeting with Moon, a dozen bodyguards, all wearing black suits and blue ties, surrounded the vehicle and jogged beside it as it made its way to the North. The men – all tall, their hair cropped short – are likely from the North’s secret service. Later Friday, as Kim returned to the South, the car moved at a faster speed and the men kept pace, running fast as they enveloped the leader. 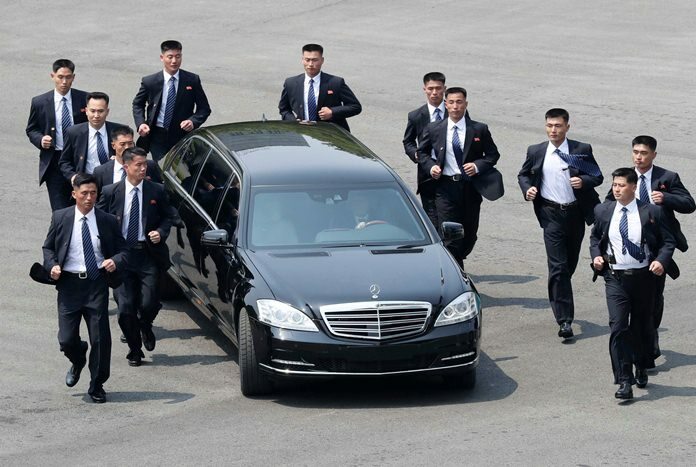 When Kim rolled back to the North after a farewell ceremony Friday night, the bodyguards reappeared and ran alongside his car again. A North Korean security worker was also seen spraying disinfectant on the chair and table to be used by Kim at the Peace House while another used a headphone and a black, square-shaped piece of equipment to check for explosives, according to South Korean media reports. Kim’s younger sister, Kim Yo Jong, took a prominent role in the summit. She handed her brother a pen when he signed the guestbook, and took his gloves after he shoveled dirt on a ceremonial tree and a bouquet of flowers that he’d been handed at the border. During the meeting with Moon, she sat next to her brother, scribbling notes. Her proximity to her brother during most of the summit events Friday added credence to speculation that she’s virtually the No.2 in the North. Kim sent his sister to South Korea in February to attend the opening ceremony of the Pyeongchang Winter Olympics, making her the first member of the North’s ruling family to visit the South since the end of the Korean War. 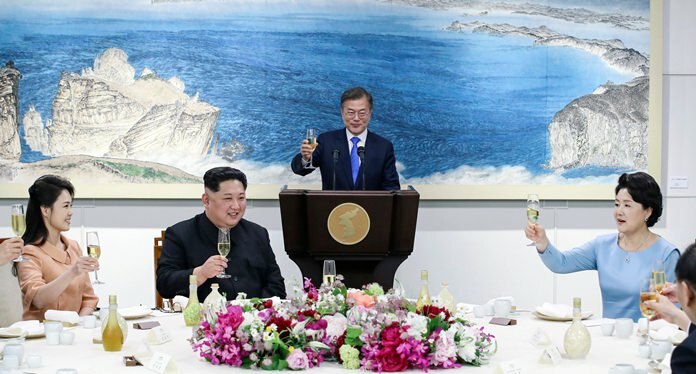 Kim acknowledged his sister’s popularity in South Korea when he joked to Moon during their talks that she has become a “star in the South,” causing her face to turn red, according to Moon’s spokesman, Yoon Young-chan. 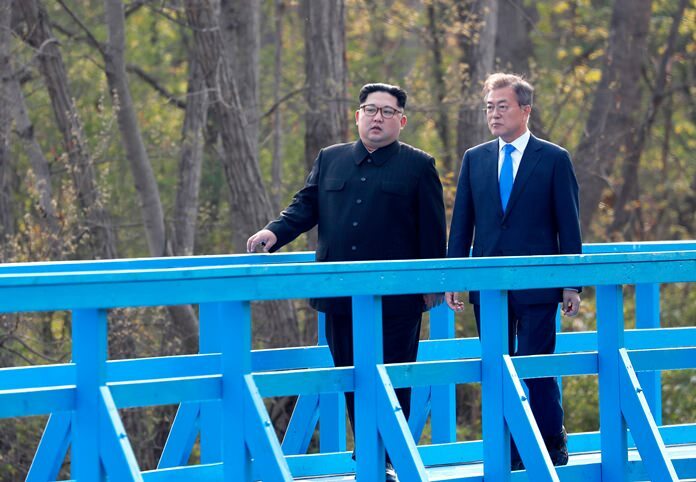 Another striking moment came when Kim and Moon chatted while strolling slowly to a footbridge in Panmunjom, where a rusty signboard marking the military demarcation line stands. There they sat, engaging in about 30 minutes of private conversation. It wasn’t clear what the leaders talked about. The chirping of birds was all that could be heard on the live TV footage. When they returned to the Peace House, they chatted again, but their conversation was largely inaudible. The two leaders’ close body language was also on display. 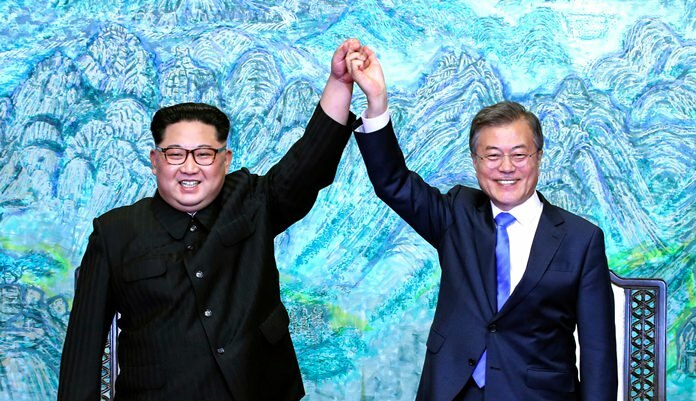 They held each other’s hands and raised them into the air and hugged each other after signing their names on what they called the Panmunjom Declaration, a joint statement following their summit. They also stood at a podium together outside the Peace House and jointly announced the deal in front of officials and pool reporters. The declaration has lots of accords on improving inter-Korean ties and exchange programs, but lacks any major progress in a U.S.-led international effort to end the North Korean nuclear standoff. During a dinner banquet, Kim appeared a little drunk, his face red, his eyes unfocused. He didn’t wear his horn-rimmed glasses as what appeared to be champagne was placed on the table before him. Kim’s wife, Ri Sol Ju, and Moon’s wife, Kim Jung-sook, also joined the banquet. Kim is a big fan of French wine and once drank 10 bottles of Bordeaux in one night, according to media reports citing the Kim family’s former sushi chef. Photos taken on April 27, 2018.